La Cabeza Del Cochino: It’s a pretty long name for a dance- El Baile de la Cabeza del Cochino. The hog head dance was a big thing in the village in the 1930’s. 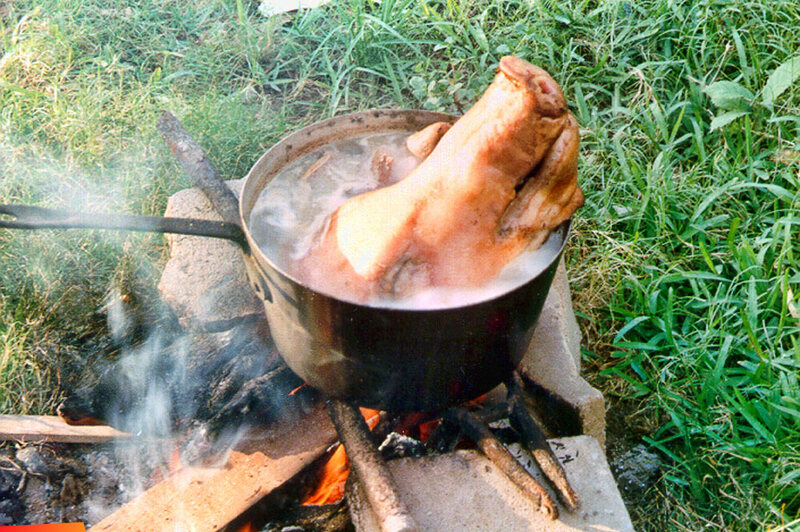 This consisted of an entire hog head being cooked. Then it was decorated with all kinds of goodies like candies, chocolates, and miniature flags. There was a designated person who would dance around with the hog head from house to house along the streets and the people would gather to applaud, sort of like we do for carnival. At the end of the dancing, the folks would all gather to enjoy the goodies including what meat there was on the hog head. This merry-making dance was very typical especially for the Dia de San Pedro celebrations. It was a social and cultural event that woke up the lackadaisical and laid back village of San Pedro of the past, so we say kudos to those involved in its revival.